extensive testing before its race début next month (18th March). 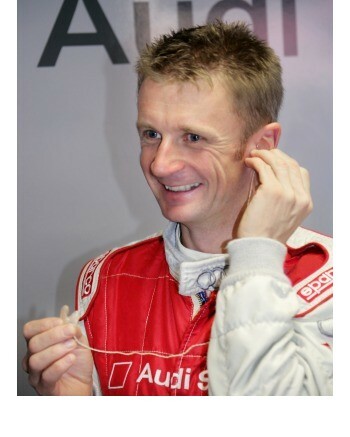 Allan McNish will aim to become the first Briton to win the Le Mans 24 Hour race driving a diesel-powered sportscar. Dumfries-born McNish, 36, is one of six drivers entrusted to début two diesel-powered Audi R10 sports-prototypes in the gruelling French marathon on 17th-18th June. McNish, who won the annual twice-around-the clock race in 1998, joins Frank Biela (Germany), Rinaldo Capello (Italy), Tom Kristensen (Denmark), Emanuele Pirro (Italy) and Marco Werner (Germany) in the two-car Joest-run "works" Audi Sport team. "I’m delighted to be driving for Audi again and especially pleased to be heading back to Le Mans as a ‘factory’ Audi driver," confirmed Allan who got his first opportunity to drive the Audi R10 earlier this month. "The Audi R10 felt comfortable after only a handful of laps. I could immediately feel it had the origins from the ultra-successful R8 in the way it rode the bumps and steered. It has a good balance - first impressions are very favourable." Having won the American Le Mans Series with Audi in 2000, McNish spent three seasons in Formula One with Toyota (2001-2) and Renault (2003) before re-joining Audi. In 2004, Allan finished runner-up in the Le Mans Endurance Series for the Audi UK Veloqx sportscar team and last year was an Audi "factory" driver in the German Touring Car Masters (DTM). The year 2006 marks the seventh time McNish has contested the Le Mans 24 Hours. The Monaco-based Scotsman made his debut in 1997 (retired) and subsequently race there in 1998 (1st), 1999 (retired), 2000 (2nd), 2004 (5th) and 2005 (3rd) - the last three occasions in an Audi R8. Allan continued: "I débuted Audi’s previous sportscar, the Audi R8, in the Sebring 12 Hours in 2000 which went on to win Le Mans five times in the last six years." "Having run for the first time in November, the Audi R10 is now undergoing a concerted development programme. Our aim is to race at Sebring in March which would be an ideal way for us to prepare for Le Mans. "Both Sebring and Le Mans will be tough for us - a brand new car featuring totally new technology which will require us to adapt our driving style due to the narrow torque band characteristics of a diesel engine and having tested it at Sebring, it does require a different driving style." Audi is the first car manufacturer to fight for overall victory at Le Mans with a diesel-engined sportscar. The Audi R10 is powered by a new 5.5-litre, V12 twin-turbo TDI engine, producing over 650 hp and a colossal 1,100 Newton metres of torque which is extremely quiet and economical. Audi first raced at Le Mans in 1999 and has won the annual sportscar "classic" five times (2000-02, ’04 & ’05) in the last six years with its Audi R8 sportscar which has scored 61 wins from 77 races around the world since 2000 but it is ineligible to race at Le Mans this year due to a change in regulations. "The R10 project is the greatest challenge ever to face Audi Sport," explains Head of Audi Motorsport Dr Wolfgang Ullrich. "It goes without saying that we needed drivers with experience in depth for this project, who also play an important roll during the development. I’m delighted that we have managed to form such a strong driving squad for Le Mans and for the test race at Sebring." The Audi R10’s first race is the 12 Hours of Sebring (USA) on 18th March which is seen as a test race for Le Mans. With the exception of Kristensen, all the Audi drivers have now tested the Audi R10. Kristensen was at the wheel of the R10 during the presentation in Paris in December and will get ample opportunity during the test and practice days before the Sebring race to familiarise himself with the new diesel sportscar. The two Audi R10 prototypes will be entered at Sebring and Le Mans by Reinhold Joest’s team which previously supported the Audi Sport Development Team during the successful R8 project years. Both Audi R10 prototypes will race under the Audi Sport North America banner at Sebring.